He gave you the best and worst dressed; he gave you who's hot and who's not and this week he brings you the 10 hottest places to see and be seen at in Jamaica. 1. Gee Jam Island Outpost Boutique Hotel: The Crown Jewel in Portland's tourism's crown. 2. Hedonism Resorts: The Party Capital of the Caribbean. 3. Margaritaville: Breathing life into MoBay, Ochi and Negril. Now it's time for its Kingston debut! 4. Round Hill Resort: The hallmark of the high-life! 5. The Royal Plantation: Styled for fab-living and nothing but! 6. The Courtleigh Hotel: One of Kingston's best-kept secrets - Weekend brunch is to die for! 7. Norma's Cook-shop (White-hall Avenue). The very best in Jamaican Cuisine! 8. Mac's Chop House: Arguably one of Kingston's finest restaurants! 9. 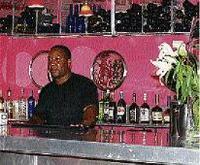 Wine With Me: Montego Bay's finest and best wine bar and restaurant! 10. Jake's: The Jewel of the south coast.